Where are you from? Your profession? I’m originally from Missouri and am currently employed as a Fiber Optic Specialist at Kennedy Space Center. Bunny is originally from Cranbury, New Jersey and is CEO of Space Coast Applications. We live in Cocoa, Florida. When and how did you become interested in paddling? Both of us have always been fairly addicted to fishing, diving, and wind surfing and, in the early 90’s, we began canoeing in the Kennedy Space Center “No Motor Zone”— an 8,000-acre manatee preserve in the Banana River. After about 20 years of incredible fishing, we retired the canoe and progressed to fishing kayaks. Around 2008, my brother in Missouri sent an article about the “world’s longest non-stop kayak canoe race.” The MR340 is a 340-mile race down the Missouri River from Kansas City to just upstream of St. Louis, with an 88-hour time limit. We were hooked! The race led us to upgrade our fishing kayaks to expedition kayaks, learn some basics, then enter and complete three MR340 races, and finally to the Paddle Florida adventures. Where is your favorite place to paddle? Bruce: My favorite place to paddle is still the Banana River No Motor Zone adjacent to Kennedy Space Center. World class fishing, abundant wildlife, a “crowded day” is a dozen kayaks or canoes. The No Motor Zone also presents the occasional paddling opportunities to view night rocket launches and in the summer nightly exhibitions of bioluminescence. Bunny: The San Juan Islands come to mind. Closer to home, Blue Springs State Park west of Orange City. I love to kayak the spring run and Hontoon Island, and then take a refreshing PFD float down the spring run. What’s the most interesting thing that ever happened to you on a paddling trip? Bruce: That’s a toss-up between two different kayak races. 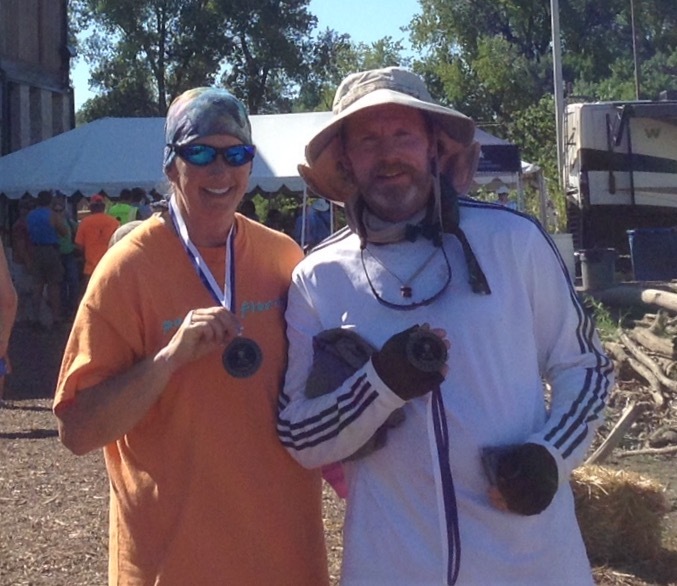 First was a 20-mile race on the Indian River just as Hurricane Sandy was off shore. During the race, a 30+ mph wind gust at the wrong moment flipped me over and, despite the two foot high wind driven waves, I was back in the kayak seat in less than 30 seconds. Shaken, no longer having fun, but at least paddling and I finished the race. The other event was a lightning show at night during one of the MR340 races. A summer storm swept in from the Great Plains and lightning flashes illuminated the tall Missouri River cliffs while coyotes yipped on the river bank. It was a treasured light and sound demonstration of Ma Nature. Bunny: I guess that would be once when paddling around Hontoon Island. I floated over a sleeping manatee and the animal panicked, lifting my boat completely out of the water and cracking the glass on the kayak. I stayed upright in a sort of “manatee rodeo” that I do not wish to repeat. How many Paddle Florida trips have you gone on and to where? The Peace and Suwannee River trips. Can you describe a Paddle Florida trip highlight? Bruce: Fossil hunting in the Peace River. Bunny: Relaxing in Madison Blue Springs.